Atonomics A/S, a consumer medical diagnostics company providing personal central lab standard data, announced today the CE marking of its first commercial product, a Lipids test panel on its proprietary Trace platform. Trace, a personal biomarker device, is a disruptive self-testing platform for accurate, low-cost, and easy-to-use diagnostics. The Lipids Panel determines total cholesterol, HDL (high density lipids), LDL (low density lipids) and triglycerides levels from a finger prick of blood with quantitative lab standard results provided within minutes. The simple cartridge test can be used to monitor the effectiveness of diet, lifestyle changes and medication to lower cholesterol which is a key marker of cardiovascular risk. The device will be linked to an app for convenient read-out and tracking. “We are delighted to launch our first product after having demonstrated that we can achieve central lab accuracy in a small and user friendly format ideally suited for point-of-care applications. While the initial CE mark is for in-vitro diagnostics (IVD) professional use, a CE mark for self-testing is targeted for later this year, which will enable us to market Trace directly to consumers for home use,” said Thomas Warthoe, CEO. The company plans to roll out a range of prevention and disease marker tests with pipeline products including HbA1c, a longer-term diabetes measure, CRP, a key inflammation marker, Vitamin levels, monitoring of diet controlled genetic diseases and many other chronic disease monitoring parameters. By using a platform approach and standard assay chemistries, implementation of new tests can typically be accomplished within a few months. “After technical and regulatory clearance of our platform technology we are now driving commercial uptake through multi-channel partnering. Beyond professional IVD and companion diagnostics pharma channels, we see rapidly growing interest in consumer facing diagnostics. Trace is well positioned to become a leading disruptive enabler in digital health,” said Oliver Hofmann, CBO. Atonomics is a consumer medical diagnostics company that has developed Trace, a self-testing device for measuring wellness and disease markers related to lifestyle and chronic disease management. Key differentiation versus competitors is the combined offering of high accuracy AND low cost, as enabled by use of a proprietary passive blood filtration approach and proven standard assay chemistries. 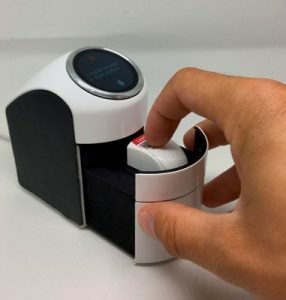 The resulting easy-to-use device is ideally positioned for screening and monitoring applications in an outpatient setting including pharmacies, health kiosks and home use. Trace™ determines total cholesterol, HDL (high density lipids), LDL (low density lipids) and triglycerides levels from a finger prick of blood with quantitative lab standard results provided within minutes. According to WHO, raised total cholesterol is a major cause of disease burden and key risk factor for heart disease and stroke. Raised cholesterol is estimated to cause 2.6m deaths per annum with a global prevalence of 39%, increased to 54% in Europe. In OECD countries ~9% of the adult population is on cholesterol lowering statin medication, with up to one in five suffering from side effects. Alternative cholesterol lowering approaches include diet change and exercise. PoC lipids testing market was $200m in 2014, estimated to grow to >$280m by 2022 (Grand View Research).